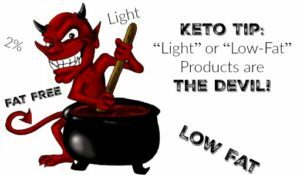 Back in the 80’s when the low fat craze was really starting to take off, we were inundated with low fat or lite products on the store shelves. Every where you looked, there was low fat yogurt, margarine, lite dressing and anything else you could think of. And believing that low fat was the way to go, we all started buying these products and put billions into the pockets of these food companies. Well what happened next? Oh that’s right. We all got fatter. And had to be put on blood pressure medicine. And had to start taking statins. And rates of cancer increased. And rates of Alzheimer’s increased. Clearly something was wrong but it took a little time to figure what that was. Turns out when you take the fat out of food, it tastes horrible do you have to doctor it up with added sugars and grain fillers to make it palatable. And what makes you fat? Oh yeah, it’s sugars and grains. All those years wasted eating margarine instead of butter and low fat mayo did nothing but make us sicker. At least now we know what’s going on and can make a better decision at the grocery store. Avoid low fat or lite foods like the plague and eat the higher fat options with no added sugar. Choose butter over margarine. Eat the high fat yogurts and sour creams. Choose the full fat milk over the 2%. Make your own dressing or just use oil and vinegar. Losing weight and getting your health back is made decision by decision and the majority of those decisions are made at the grocery store. Make good decisions there and half the battle is done! NEXT POST Next post: 10/12 Weightloss Wednesday: Plateau Shattered and Major Goal Reached!